The dictionary indicates that “pace” and “speed” can both mean “rate of progress,” but in the speedometer-less high peaks we need “pace” to mean something more subjective. 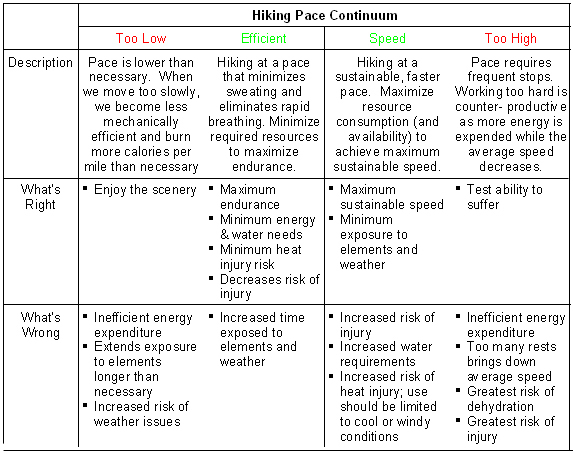 We say “pace” to mean our overall energy output that we monitor via symptoms such as rapid breathing and heavy sweating, and we use the term as in the phrase, “pace yourself.” When we select a hiking pace, we are selecting an exertion level between two possible extremes: high exertion and long exertion. We can work at a very high rate for a short period of time, we can work for a very long period of time by using a low rate of exertion, or we can select some level in between. As we hike, we consciously and subconsciously measure our level of effort to maintain a pace that balances our needs to move as fast as possible without becoming exhausted and to have long endurance without moving too slowly. This balancing act represents our hiking pace management, and it is how we measure out the pace that we can sustain long enough to cover the necessary distance and attitude. We apply our pace of exertion to the external conditions to produce speed. The two factors most influencing our speed atop the high peaks are our personal physiology and the steepness of the terrain we need to cover. Our personal physiology includes our body structure, ability to gather and use oxygen efficiently, muscle strength and ability to refuel our muscles efficiently, and our nutritional state, and it determines our personal maximum sustainable level of energy output or pace of exertion for the length of time needed to cover a given distance and altitude in the high peaks. Our hiking energy output is used to hold our body weight up, move our arms and legs, and moving our center of gravity up, down and over angled terrain while balancing our weight over one or two feet. This use of energy to push our body over ground and up hills results in work done over time, or more specifically, miles and feet of altitude per hour (speed of hiking). With a constant energy output or pace of exertion, the steepness of the terrain is a primary influence on our speed. The first thing anyone discovers hiking atop the high peaks is that uphill is harder than flat ground, and the steeper the slope the harder it is. The second discovery is that downhill is easier unless it is too steep, when it becomes hard again. So, slope angle matters. Scientific study and my own personal experience show that in the high peaks a slope angle of approximately 10 degrees (or approximately 1000 feet of elevation per mile) allows the fastest speed in terms of feet of elevation gained per hour. While it is easier to hike over flat ground than up a hill, adventuring atop the high peaks requires that we ascend significant altitude as well as covers miles of distance. If the slope angle is low, we cannot gain much altitude; on the other hand, then the slope is very steep, we cannot move quickly to gain horizontal or vertical distance. We can generalize by saying that overall sustainable speed (combined horizontal and vertical progress) rises as terrain becomes steeper, up to approximately 10 degrees of slope angle. At that angle, we enjoy the highest efficiency and sustainable speed in hiking uphill to gain distance and altitude. Above a 20-degree slope, the effort uphill and downhill increase significantly. In planning for and executing our hikes, we should seek out slope angles of 10 degrees. When the terrain is steeper, we should use switchbacks to reduce the slope angle to the ideal 10 degrees. Underlying our ability to move our body over distance and elevation and to be able to predict a speed for any hike is our pace of exertion. There is no “right” pace for everyone, but there is always a sensible one given the personal and environmental circumstances. The “wrong” pace is the one that consumes more resources than are available and that causes us to fail or become unhealthy. The range of possible effective paces is anchored near the low end and varies somewhat in the emphasis of speed vs. endurance. On the low end of the range, we have an “efficiency” strategy that focuses on endurance; somewhat further toward the high end of the range, we have a “speed” strategy that eases the almost religious obsession with efficiency so that we can get a bit more speed when the circumstances allow. An “efficiency” strategy is one were we focus on using the least amount of energy per mile. This is done to minimize the resources needed to successfully complete a distant objective. To need fewer resources, we have to use fewer resources. A base level of energy and water is consumed simply by being alive regardless of our activity level; by moving more slowly, we consume more resources by staying atop the high peaks longer. Fortunately, our “efficient” speed is very inexpensive compared to faster or slower speeds. As we hike faster than the “efficient” speed, our energy output rises exponentially (up to our maximum level of output). As we hike slower, our energy output rises a small amount and we remain at this output level for a longer period of time. As a result, we can operate on minimum amount of energy and water by hiking at an “efficient” pace. In addition, hiking at an “efficient” pace allow us process sufficient oxygen to remain in an aerobic state, which allows us to burn the fats we carry in our bodies as energy stores. When we exercise too vigorously to burn fats, we must rely on glycogen that can be burned anaerobically while it lasts, resulting in a build up of lactic acid. 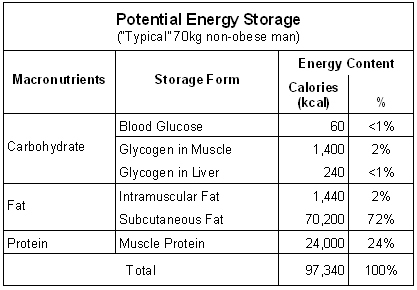 See the table below to see the relative proportions of fat we store as fuel compared to glycogen. A “speed” strategy is one where we focus on funding (feeding) a sustainably high pace. This is done to minimize the time needed to successfully complete an objective. To work harder, we need to have more resources (water, carbohydrates & oxygen) and/or be able to continue operating with a resource deficit that accumulates during the hiking timeframe. At the pace contemplated here, the primary resource is water. As even a small amount of dehydration is a problem, we can only focus on speed if we can find water on the trail or if we are only planning to endure a water shortage for a very short time. We also need sufficient carbohydrates and electrolytes to replace the lost nutrients. To manage our hiking pace and avoid hiking related problems, we bring attention to bear at three different times: before hiking, during hiking and after a hiking problem has developed. These three timeframes are the basis for Hiking Speed Management. Return to Hiking Speed Management to read the other related articles. I hike with an engineer and we discussed at length on our last hikes So, How do we measure our physical output on hikes? Do we calculate the amount of work to carry our weight for the miles flat, add the amount needed to carry our weight up? Also, dont think we give it all back on the way down, in fact I think we constantly work at reducing our speed on the way down.